The cathode materials are made up of cobalt, nickel, and manganese in the crystal structure. This crystal structure forms a multi-metal oxide material to which lithium is added. Originally, the primary active component of the cathode was cobalt. Today, cobalt is frequently substituted partially with nickel (NCM, NCA). The most prominent cathode chemistries are Nickel Manganese Cobalt (NCM), Nickel Cobalt Aluminum (NCA), Lithium Cobalt Oxide (LCO), Lithium Manganese Oxide (LMO), and Lithium Iron Phosphate (LFP). Cathode materials are widely used in lithium-ion batteries for use in the automotive industry, energy storage systems, power tools, and consumer electronics. The cathode materials market is expected to grow at a CAGR of 14.0% and 16.3% between 2018 and 2023 in terms of value and volume respectively. The report is a compilation of the different segments of the global cathode materials market, including market breakdown by cathode materials type, end-user industry, and geographical areas. Herein the revenue generated from the cathode materials types, namely: NCM, NCA, LCO, LMO, and LFP; end-user industry, namely consumer electronics, power tools, automotive, and energy storage systems; and geographies, namely: North America, Europe, Asia-Pacific, Middle East & Africa, and South America are tracked to calculate the overall market size, both in terms of value ($million) and volume (kilotons). The report also provides market numbers and analysis on cross segments which includes country by type and end-user industries. While highlighting the key driving and restraining forces for this market, the report also provides a detailed summary of the global cathode materials market. It also includes the key participants involved in the industry at the relevant sections. • What was the size, in terms of value ($million) and volume (kilotons) of the cathode materials market in 2017, and what will be the growth rate during the forecast period, 2018-2023? • What is the market size of different types of cathode materials (by value and volume) and their growth rate during the forecast period, 2018-2023? • How will each end-user industry of cathode materials market grow during the forecast period and what will be the market size (by value and volume) of each of the end-user industry by the end of 2023? • What is the market size for different regions and countries in terms of value and volume in the cathode materials market and their growth across the forecast period, 2018 to 2023? • What is the market size for different regions by type and end-user industry in terms of value and volume ($million and kilotons) in the cathode materials market and their growth across the forecast period, 2018 to 2023? • What is the market size for different countries by type and end-user industry in terms of value and volume ($million and kilotons) in the cathode materials market and their growth across the forecast period, 2018 to 2023? • What are the major driving forces that tend to increase the demand for cathode materials market during the forecast period? • What are the major challenges inhibiting the growth of the global cathode materials market? • What is the competitive strength of key players in the global cathode materials market by analyzing through market share analysis? • What is the market scenario of other associated markets in the cathode materials value chain? Further, the report includes an exhaustive analysis of the geographical split into North America, Europe, Asia-Pacific (APAC), Middle East & Africa, and South America. Each geography details the individual push and pull forces in addition to the key players from that region. Some of the key players in the global cathode materials market include BASF SE, ALEEES, L&F Co., Ltd., Mitsubishi Chemical Corporation, NEI Corporation, Nichia Corporation, Nippon Chemical Industrial Co., Ltd., PULEAD, Shanshan Co., Ltd., Sumitomo Corporation, Tanaka Chemical Corporation, Targray, Toda Kogyo Corp, and Umicore N.V. Few customers or end-users in the cathode materials market are GS Yuasa International Ltd., Hitachi Ltd., Samsung SDI Co., Ltd., and Tesla, Inc.
9.1 Advanced Lithium Electrochemistry (Cayman) Co., Ltd.
9.3 Hunan Rui Xiang New Material Co., Ltd.
9.9 Peking University Science and Technology Industry Co., Ltd.
10.1 GS Yuasa International Ltd.
10.3 Samsung SDI Co., Ltd.
Table 7.76 Ongoing Research Programs regarding Electric Vehicles and Fuel Cell Vehicles in the U.K. Batteries have always been an integral part of technological developments, be it in the field of consumer electronics, automotive, aerospace, infrastructure, or others. The first battery was developed by the Italian physicist Alessandro Volta in 1800. 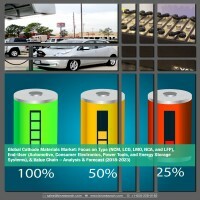 Since then, various advancements have taken place in the field of batteries. In 1980, the American physicist Professor John Goodenough invented lithium-ion battery in which lithium could migrate from one electrode to another. Various technological advancements have been performed by the manufacturers in order to make lithium-ion batteries safe for use in mobile phones. Manganese lithium-ion batteries were the first lithium-ion cells to be used in mobile phone. In 1991, Sony combined lithium cobalt oxide cathode with carbon anode in order to manufacture the first commercial rechargeable batteries. Over the years, manufacturers have focused on further enhancing lithium-ion batteries which are now used in the automotive sector, mobile phones, laptops, energy storage systems, and power tools. Lithium-ion Batteries (LiBs) are known for their high energy density and high load capacity, the efficiency of which depends on variety of factors. However, the overall performance of LiBs strongly relies on the structures and properties of the materials used, which are cathode materials and anode materials. LiB is a family of battery chemistries having various combinations of anode and cathode materials and each combination has distinct advantages and disadvantages in terms of safety, performance, cost, and other parameters. The key to boost the development of advanced LiBs is to meet the demand for electrode materials (cathode) for Electric Vehicles (EVs). The cathode acts as a key element dictating the differences in composition while building positive electrodes for the battery cells. The cathode materials are made up of cobalt, nickel, and manganese in the crystal structure. This crystal structure forms a multi-metal oxide material to which lithium is added. Originally, the primary active component of the cathode was cobalt. Today, cobalt is frequently substituted partly with nickel (NCM, NCA). The most prominent cathode chemistries are Nickel Manganese Cobalt (NCM), Nickel Cobalt Aluminum (NCA), Lithium Cobalt Oxide (LCO), Lithium Manganese Oxide (LMO), and Lithium Iron Phosphate (LFP). The global cathode materials market is expected to grow at a CAGR of 14.0% from 2018 to 2023. Among the various chemistries of cathode materials, the highest growth rate is expected for NCM, followed by LCO and LFP. Production of NCA material, is currently dominated by Japan, that may also present an opportunity for the existing or the newly emerging European Union (EU) manufacturers. However, the technological breakthrough may lead to the use of different cathode materials which in turn may affect the global cathode manufacturing sector. Some of the factors driving the global market for cathode materials are rising demand for electric vehicles, increased use of lithium-ion batteries in energy storage systems, and stringent governmental regulations to improve the fuel economies of vehicles across the globe. Cathode materials find wide applications in lithium-ion batteries used in consumer electronics, power tools, automotive, and consumer electronics. In 2017, consumer electronics segment dominated the global market of cathode materials. The increasing demand of mobile phones, laptops, digital cameras, and other electronic devices is expected to boost the demand for lithium-ion batteries which in turn would affect the global demand of the cathode materials. The longer battery life of lithium-ion cells is expected to boost the demand for cathode materials in the global market. LCO cathode material is widely used in small lithium-ion cells in consumer electronics owing to its excellent energy density properties. The Asia-Pacific region is the fastest growing region in the cathode materials market. The key players in the lithium-ion battery industry are investing on strategic expansions in order to gain a strong foothold in China and other countries. Amperex Technology Ltd (CATL), Panasonic Corp., LG Chem Ltd., and Boston Power Inc. invested massive amount of money for the construction of new lithium-ion battery plants in China. Other key companies, such as Samsung and BYD Co. are focusing on the expansion of their existing factories to meet the demand for the cathode materials in the Asia-Pacific region. The competitive landscape of the global cathode materials market includes different strategies undertaken by the cathode materials and lithium-ion battery manufacturers in order to gain significant market presence. Some of the strategies that have been adopted by the cathode materials manufacturers are expansions, new product launches and developments, partnerships, collaborations, contracts and agreements, and mergers and acquisitions. Some of the key players in the global cathode materials market include BASF SE, ALEEES, L&F Co., Ltd., Mitsubishi Chemical Corporation, NEI Corporation, Nichia Corporation, Nippon Chemical Industrial Co., Ltd., PULEAD, Shanshan Co., Ltd., Sumitomo Corporation, Tanaka Chemical Corporation, Targray, Toda Kogyo Corp, and Umicore N.V. Few of the customers or end-users in the cathode materials market are GS Yuasa International Ltd., Hitachi Ltd., Samsung SDI Co., Ltd., and Tesla, Inc.
As the technology is evolving, assorted options are likely to coexist and any player who succeeds in finding the optimum option will gain a significant advantage in the market place. Hence, the cell manufacturers face both the intense pressure and growth opportunity at the same time. Diversification of the product is expected to give way to a technological and cost shakeout in the short to medium term. This is on the account of more number of market players entering into superior technology to win contracts. This consequently is increasing the production volumes to meet economies of scale. The industry expects these winners to either overcome or acquire small players, driving industry consolidation.